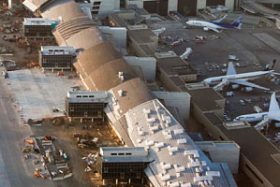 ON-SITE TECHNICAL SERVICES, INC. is currently providing inspection or has recently provided inspection for the following projects at LAX. 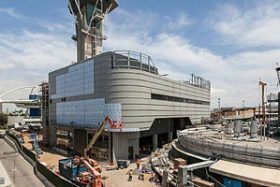 The Los Angeles World Airports (LAWA) Tom Bradley International Terminal (TBIT) Renovation, Apron, and Concourse Demolition at Los Angeles International Airport is a $1.9bn project and is part of the LAX’s $4.1bn Capital Improvements Program. 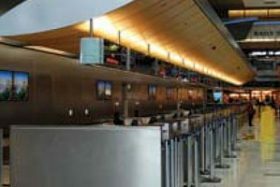 The construction of this project involves Demolition of existing concourses and construction of aircraft parking aprons, New Passenger Boarding Bridges, New 20-lane Security Screening Check Point, New utility and communications duct banks, Reconfiguration of existing baggage handling systems, New loading docks and ramps, improvements to the terminal systems, expansion and upgrades to ticket counters. After the existing international concourse is demolished, the construction to reconfigure the airfield around the Bradley West Terminal will install close to one million square-feet of airfield paving. The concourses will be replaced by new aircraft parking aprons and two taxi lanes. ON-SITE provided Quality Assurance fabrication inspection services on behalf of LAX of the mechanical equipment, structural steel, stairs, railings, ductile iron pipe, concrete reinforced pipe, valves, roof joists, transformers, switchgear and cast iron floor hatches, glass supported railing, modular air handling units, fixed walk ways, at various locations throughout the U.S. The Bradley West Project estimated at $1.5 Billion is composed of approximately 1.25 million square feet of new building area, including food/beverage and retail concessions, new premium lounge space, enlarged Federal Inspection/Customs and Border Protection facilities and other passenger amenities. In addition, the new concourses will contain 15 new boarding gates and enlarged passenger seating/holdroom areas sized to accommodate new-generation aircraft such as the Airbus A380 super-jumbo jet and the Boeing B787 Dreamliner. ON-SITE performed shop fabrication inspection services of the mechanical equipment, structural steel, stairs, railings, ductile iron pipe, concrete reinforced pipe, valves, roof joists, transformers, switchgear and cast iron floor hatches at various locations throughout the U.S. The Crossfield Taxiway project estimated at $82 Million will connect LAX’s north and south airfields and is expected to improve the safety and efficiency of aircraft ground movement and alleviate periodic congestion that occurs on the existing taxiway and a replacement apron for aircraft overnight parking. 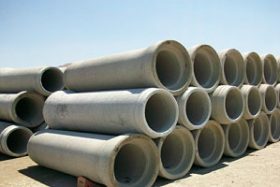 ON-SITE provided shop fabrication inspection services of the reinforced concrete pipe, ductile iron piping and fittings, cast iron hatches and grates, small HP pumps and valves, oil water separator tanks, and sluice gates at various locations throughout the U.S. The Taxilane S Project estimated at $95 Million will demolish several existing tenant buildings, including hazardous material remediation prior to demolition, remediation of existing contaminated soil, demolition of existing asphalt and concrete apron and taxiway pavement, construction of new portland cement concrete taxiway and apron pavement, airfield lighting and signage, and other miscellaneous site work. 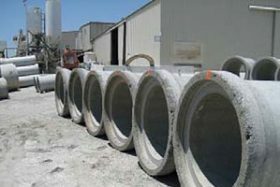 ON-SITE provided shop fabrication inspection services of the Reinforced Concrete Pipe. The Aircraft Rescue and Fire Fighting Facility (ARFF)- Fire Station 80 Project replaced the old facility and is an important component of the Crossfield Taxiway Project. The older station was 40 years old and had limited storage and training areas. The new facility is better suited to accommodate the size, volume and nature of operations at LAX associated with newer generation aircraft. 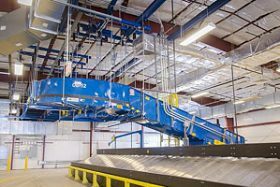 The new ARFF is double in size of the original with approximately 27,500 square feet, including seven bays to house and maintain rescue vehicles and emergency response equipment. Additionally, the facility provides appropriate living, training and administration areas for 14 firefighters assigned to each 24-hour shift. 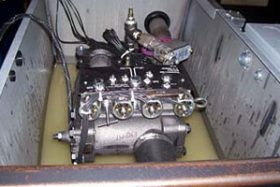 ON-SITE provided shop fabrication inspection services of the elevator and motor systems at locations throughout the U.S. The Tom Bradley International Terminal project estimated at $503 Million is designed to reduce congestion, increase safety and provide additional amenities for travelers by adding new ticket counters, baggage areas, and new baggage security screening facility. The Southside Runway Improvements Project estimated at $40 Million will improve various airfield intersections and modify service road locations to provide safe taxiing routes for current large aircraft and future New Large Aircraft. 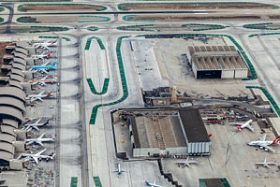 This second phase includes widening of 12 intersections throughout the north and south airfield complex at LAX, specifically in the vicinity of Taxiways E and C and Runways 24L and 25R. The project will include intersection pavement and shoulder reconstruction and relocation of all affected taxiway lighting and signage. ON-SITE provided shop fabrication inspection services of the Structural Steel, Chain Link Fence, Fuel Storage Tanks, Overhead Coiling Doors, and Louvers at various locations throughout the U.S. The Theme Building Restoration project estimated at $8 Million will reconstruct the upper and lower arches to restore the appearance and provide weather protection. The entire structure will be seismically retrofitted using FEMA 356 as the design guideline to a Collapse Prevention level. 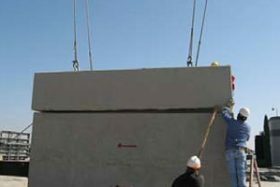 This will be accomplished using a Tuned Mass Damper on top of the elevator core and conventional shotcrete at various locations in the basement and first floors. 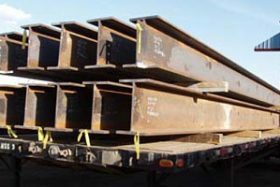 ON-SITE provided shop fabrication inspection services of structural steel and embeds. The Runway 25L & Center Taxiway Project estimated at $250 Million will provide for the relocation and reconstruction of Runway 25L-7R, and the subsequent construction of a center taxiway between Runways 25L-7R and 25R-7L. 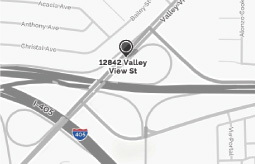 The project includes removal of existing deteriorated concrete runway and taxiway pavement, construction of Portland Cement Concrete pavement and asphalt concrete pavement, new airfield signage and lighting systems, airfield pavement markings, storm drains, structural improvements to the approach slabs over the Sepulveda Tunnel and other related runway/taxiway intersections improvements. 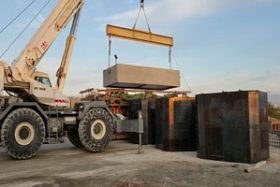 ON-SITE provided shop fabrication inspection services of the Precast Storm Water Separators, Aluminum Swirl Chambers, Cast Iron Manhole Rings and Covers, and Airfield Signs. This project is an integral part of the infrastructure and modernization program for Los Angeles World Airport’s (LAWA) commitment to maintain a safe and secure airport. As part of the proposed Runway 6L-24R and Runway 6R-24L Runway Safety Area (RSA) and Associated Improvements Project, the RSA’s for both Runways 6L-24R and 6R-24L will be improved to enhance safety and maintain efficient operations. The mandated improvements will provide an extra margin of safety for landing and departing aircraft. RSAs provide a buffer zone should an aircraft overshoot, overrun or veer off a runway while landing or taking off, and are typically 1,000 feet by 500 feet at each runway end and 250 feet from the runway centreline. ON-SITE provided shop fabrication inspection services of the Airfield lighting base cans, Precast Storm Water Separators, Aluminum Swirl Chambers, Cast Iron Manhole Rings and Covers, and Airfield Signs. This $56M project is part of an airfield improvement program that will ultimately provide a dual taxilane system west of the new Tom Bradley International Terminal and east of the future Midfield Concourse. Taxilane T is being constructed in three phases. The first phase of the work consisted of site demolition work necessary to clear the site for construction. This report covers the scope of work related to the first phase of Taxilane construction. The new Taxilane T, with the newly constructed Taxilane S, is part of a dual taxilane system connecting the north and south airfields which allows for increased operational efficiency for the Tom Bradley International Terminal and for greater north-south taxiing capability for all terminals at LAX. ON-SITE provided shop fabrication inspection services of the reinforced concrete pipe, electrical switch boards, high mast poles, fuel piping, ductile iron piping and fittings, cast iron hatches and grates, small HP pumps and valves, oil water separator tanks, and sluice gates at various locations throughout the U.S. The construction of LAX’s $118 million Central Terminal Area Project will provide a new, dramatically upgraded look for LAX with the installation of modern LED street lighting, wayfinding components and new canopies for Terminals 3 and 4. 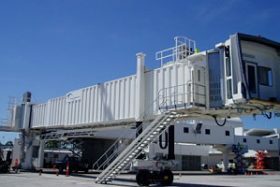 Replacement of aged passenger boarding bridges with modern equipment that, in addition to new enclosed walkways, includes connections to provide parked aircraft with water, power, and preconditioned (cooled or heated) air. Tom Bradley International Terminal Passenger Boarding Bridges was comprised of fifteen (15) apron drive passenger boarding bridges. Under the renovation program, LAWA plans remove and place into storage all 15 PBBs for future use on Terminals 2, 3 & 6. 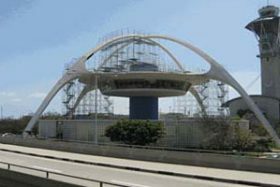 ON-SITE provided shop fabrication inspection services of the mechanical, electrical and structural steel at various locations throughout the U.S.
LAX’s Terminals have been serving their purpose without major renovations or modernization efforts for years. As needs change, the Terminal spaces and structures need repairs, upgrades, modernization, and standardization to satisfy these changing demands. From modernizing elevators and escalators with standardized devices to updating fire/life safety systems, the Terminals Element is focused on implementing these necessary improvements. The $79.8M West Aircraft Maintenance Area Project includes mass grading of entire site, construction of approximately 100,000 square yards of concrete pavement section for the aircraft maintenance ramp, Remain Over Night apron and new connector taxiway along with asphalt shoulder and service road construction, utility infrastructure and associated support facilities for the entire site.